With everyone safe from the tsunami on Oahu, it’s now back to Cynthia’s adventures. A Whole Foods! A Whole Foods in the Kahala Mall! I was so excited to find my gluten-free and organic foods (Yeah, I know, the whole Monsanto thing, but still, local produce! )and it was familiar. I shopped Whole Foods back in the Bay Area. I was dreaming of their Classic Roasted Chicken for dinner, with veggies and anything but rice. While Mark grabbed a cart, I raced to the deli section to find my chicken…..Huli Huli chicken? What?…no classic roast with herbs and olive oil? Not here. Sugar, brown sugar to be exact, is the primary ingredient in Huli Huli chicken. Disappointed, I searched for another type of chicken in the hot food case. I settled on stir fry vegetable mixed with grilled chicken. Mark and I planned to take a couple of pre-made dinners to the beach the following night. While the man behind the counter packed our boxes, I turned to the left to find, attached to the hot case, a plastic container filled with chopsticks. No forks. Just chopsticks. It’s a good thing Mark taught me to use those skinny sticks, otherwise I’d go hungry or resort to the gauche finger-eating style of consuming food! We stopped at Walmart for cleaning supplies before we met Mark’s aunt at her downtown Honolulu office. 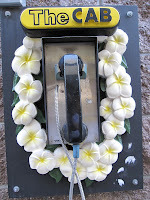 Here’s a hotline phone for a cab, covered in fake plumeria flowers. There was a pay phone next to it. I don’t remember the last time a saw a pay phone in the Bay Area. Oh, and Walmart prices in Honolulu are the same as on the mainland. After meeting Mark’s aunt and uncle, we cleaned the condo with our newly acquired cleaning supplies. For dinner we ventured back to Kahala. We found Greek Food next to the Kahala mall, but they only accepted cash and we were conserving our cash. You see, banks in Hawaii are different than the rest of the U.S. There’s no BofA or Wells Fargo. Bank of Hawaii (Bank Oh) and First Hawaiian are the ones seen everywhere. We kept driving to St. Louis Heights and found a Greek restaurant. This is well out of the tourist zone. Everyone wore t-shirts, tanks, jeans, capris, flip-flops (slippahs) and running shoes. We were the only ones wearing aloha shirts. The food was delicious. The meat was grilled without a sugar or gravy coating on it and not a speck of rice was found on my plate! While eating, I realized I needed to fit in if I was going to live here. Healthy eating I won’t compromise on, but clothing I will change. We went to Ala Moana for shopping the following day. That night, while wearing my new lightweight shirt and capri pants, Mark and I ate Whole Foods dinners and watched the fireworks on the beach in front of the Hilton Hawaiian Village. It was a great show, but don’t be late. It only lasts five minutes. Next up, our road trip to Kailua!